Check the Contact Page for more information. The festival will begin at 5pm Friday and will finish at 6:00pm Sunday. We expect that the entrance will be crowded with pedestrians from around 3:30pm Friday. Therefore Stalls must be set-up and vehicles removed by 3pm on Friday. Similarly, if setting up on Saturday or Sunday morning, there will be no vehicle movement allowed after 9am. Please Note: We expect a lot of people in the festival area well prior to the festival start as crews setup the venue and patrons seek the better camping areas. Similarly we expect some patrons to stay over until Monday morning. Stall holders, especially food vendors may wish to take advantage of this. Vendors are welcome to set up any time from Thursday evening and all sites are to be cleared by 2:00pm Monday. There are no powered sites available. All vendors are required to supply their own power. If you are interested in sharing the cost of generator hire, you should contact Kerry ASAP. Payment is required up front and is not refundable. Friday afternoon to Sunday night. Each vendor site includes 2 x festival tickets. Sunday 9:00am – 2:00pm only. Each Sunday vendor site includes 2 x Sunday festival tickets. Camping for vendors is free. Extra staff for vendors or market stalls will be required to purchase festival or day tickets. Concession prices will apply. Stall holders must have current public liability insurance. Food Stalls must have appropriate registration. Food Stall Operators must have appropriate food handling certification. All under cover areas and the food precinct are Non-Smoking Zones during festival hours. Stall holders may camp in their stall site. No open fires are allowed within the festival or camping sites. Firearms, Fireworks, Pyrotechnics, explosives and illegal substances are banned from the festival area. Possession, sale or use of any banned items will result in instant expulsion from the festival, and a report will be submitted to the relevant authorities. Declaration: All details given above are true and correct. 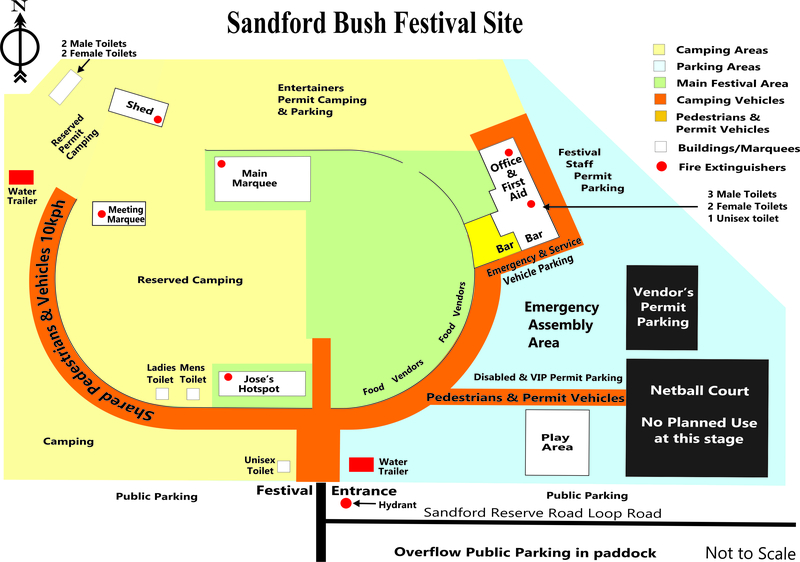 I have read and agree to abide by the rules and guidelines for stall holders as laid down by the Sandford Bush Festival. Please Note: If your application is successful, full payment will be required within 14 days of acceptance. If payment is not received by the due date we will assume that you no longer require the site.